Hello Fellow Hams and radio collectors! 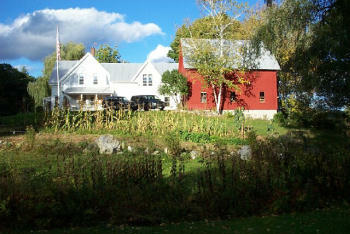 I am semi retired working an apple farm with my wife and two German Shepards in a small village in a small valley in the White Mountains region of Northern New Hampshire. My key ham radio interest is in restoring old tube type broadcast and shortwave radios and particularly big, black, heavy, smelly military rigs of WWII vintage! My favorite mode of operation is AM and CW. My favorite rig is my BC610E transmitter/RBB receiver combination but I also operate an ART-13/BC348 combination regularly on the Gray Haired Net Tuesday nights on 1.945 mHz as well as the Old Military Radio Net early Sat morning on 3.885 mHz. For field work I use a TCS-12 or a BC654. The main antenna is a 350' longwire up 40'-50'. For photos and an interesting article on my BC610E, check out www.hamelectronics.com and go to W1CKI's site. Meanwhile, see you on the air on AM/CW------Reeeeal Raaaadio! 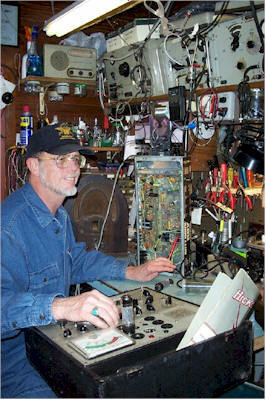 If my radio repair bench looks like what you would expect to see on board a WWII Navy battleship there is a good reason! Almost all my test equipment is high quality, military surplus, tube type test gear I have restored myself. The only exception is a solid state frequency meter calibrated to government national standards and an HP 200 mHz oscilloscope. Both are required for accurate calibration and signal tracing of radios I repair. This room is actually the tack room in my 100+ year old barn that I have converted into my ham radio shack. Not shown in the picture is about a half ton of old WWII military transmitters and receivers I have restored and use regularly on the ham bands. (All tube type stuff, of course!). The top level of the barn is a storage area for hundreds of radios waiting to be restored. Also six file cabnets of Sam's Photofacts for those tricky repairs. In the bottom of the barn is a complete wood cabinet restoration area and painting area and a compressor for painting and blowing out dust and grime out of tuning capacitors, IF cans and chassis. Retired from the high tech industry of 30 years with several technical degrees, what I realy like to do is to repair and restore customer's antique and vintage radios and electronics from that fantastic, golden age of radio pioneered by my father's great generation! Given the quality of the components, the wonderful workmanship, and knowing the kind of world news and music these radios brought into the homes of that generation, makes my repair, restoration and sales service an honor to do! I think a lot of you collectors out there might feel the same way! So, let's "Hear them Play Again!"